We dropped SeaDrill (NYSE: SDRL) from our Energy & Income Advisor Focus List in September 2013, when the stock had surged to $45.00 per share–more than $12.00 above the current quote. As far back as 2007, SeaDrill had been one of our top picks. And we pounded the table for the stock in the aftermath of the 2010 oil spill in the Gulf of Mexico, when the the shares went for less than $20.00. Many investors who haven’t joined Energy & Income Advisor still own the stock; here’s why we currently rate SeaDrill a Sell. With a dividend yield of 11.2 percent, the industry’s most modern fleet and a historically attractive valuation, shares of offshore contract driller SeaDrill are a tempting morsel for income-seeking investors. But SeaDrill looks like a value trap right now: Deteriorating fundamentals in the offshore drilling market will keep a lid on any upside in the stock over the next six to 12 months and could send the share price even lower. However, we recently added a name to our Model Portfolio that stands to benefit from the pain in the offshore drilling market. 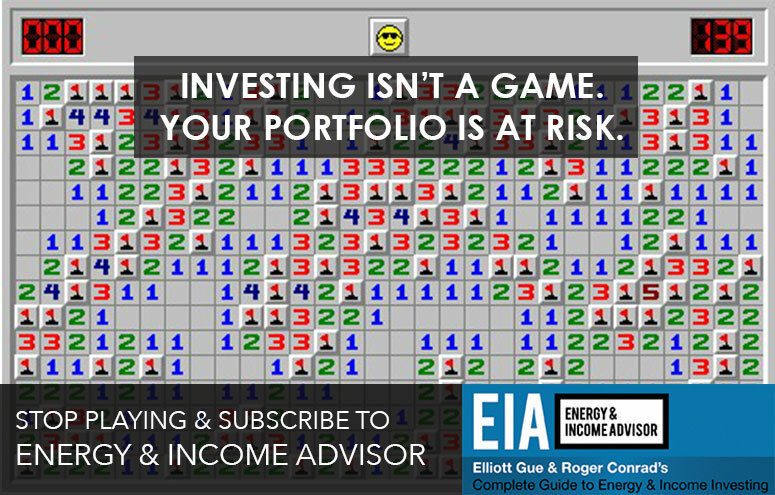 Sign up today and save $350 on an annual subscription to Energy & Income Advisor. Contract drillers are in the business of leasing rigs to oil and gas producers for a daily fee. SeaDrill’s customer base consists primarily of major integrated oil companies–the likes of BP (LSE: BP, NYSE: BP), Chevron Corp (NYSE: CVX), Royal Dutch Shell (LSE: RDSA, RDSB; NYSE: RDS A, RDS B) and Total (Paris: FP, NYSE: TOT). State-sponsored oil companies such as Statoil (Oslo: STL, NYSE: STO) and Petrobras (NYSE: PBR, Sao Paulo: PETR4) are also in the mix. Over the past several years, integrated and national oil companies invested heavily in exploration and development to offset their legacy assets’ natural decline rates and take advantage of elevated oil and gas prices in international markets. The 12 largest publicly traded oil and gas producers (by market capitalization) increased their total capital expenditures to more than $350 billion last year from $250 billion in 2010. 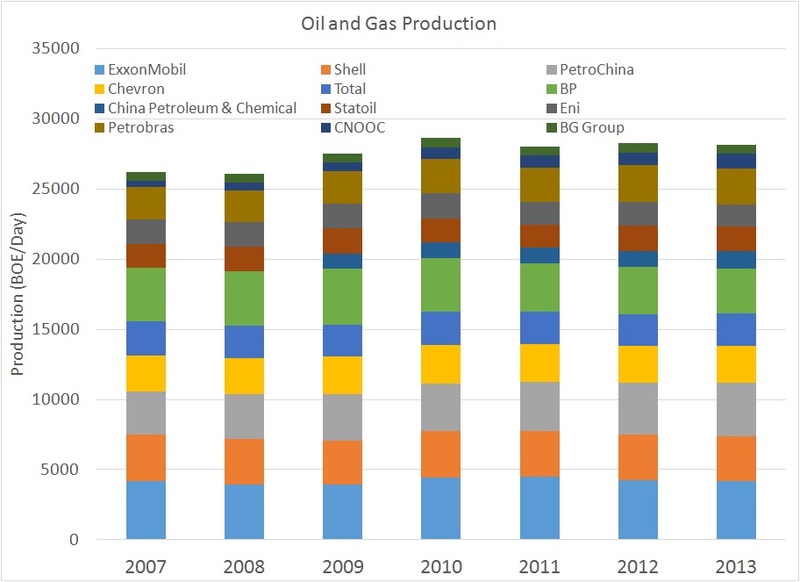 Despite these huge investments, these energy giants have generated only modest production growth over the past five years. While capital spending soared between 2010 and 2013, the world’s 12 largest publicly traded oil and gas companies posted a 1.6 percent decline in their total hydrocarbon production. Global producers have experienced rapid cost inflation in their exploration and development projects, but these increasingly expensive investments have yet to deliver meaningful production growth. Given investors’ disenchantment with these returns, several producers have scaled back their drilling activity and reevaluated the efficiency of their capital-spending plans. The first major producer to blink was France-based Total, which used its September 2013 Analyst Day to announce reductions to its organic capital spending on exploration and development in 2014. The international energy giant had just completed an intense three-year investment program that ramped up from US$18.3 billion in 2010 to a record US$29.8 billion in 2013. At the company’s Analyst Day, CEO Christophe de Margerie described these spending cuts as a “soft landing” and reassured investors that the company remained committed its longer-term production targets. Total expects to reduce its annual capital expenditures to between US$25 and US$26 billion by 2015. By reducing capital expenditures while delivering modest production growth, Total should generate additional cash flow to buy back stock or pay a higher dividend. Wall Street analysts applauded Total’s plan to scale back its capital expenditures as a shareholder-friendly move. The company’s stock has also responded, rallying by 18 percent since the end of September. But this strategic shift represents a headwind for firms that provide exploration-related services and equipment. These concerns gained additional traction after Royal Dutch Shell pre-announced fourth-quarter earnings that fell about US$2 billion short of analysts’ consensus estimate. Management attributed this shortfall to soaring capital expenditures for finding and developing new oil and gas resources; the company’s exploration and production bill hit US$42.6 billion in 2013–a huge jump from US$26.3 billion in 2011. Royal Dutch Shell has already written down the value of its shale gas properties in the US because of depressed prices at Henry Hub, La. And the firm shelved plans to build a US$20 billion plant on the Louisiana’s Gulf Coast that would convert natural gas into liquid fuels. Disenchanted investors should expect additional write-downs on unsuccessful exploration efforts in French Guiana and elsewhere. Our ambitious growth drive over recent years has yielded a step change in Shell’s portfolio and option set with more growth to come. But at the same time, we have lost momentum and we can sharpen up our performance in a number of areas. So we are changing emphasis in order to improve our returns and cash flow performance. I want to focus on an improved financial performance, enhancing capital efficiency and continued strong delivery of new projects. And 2014 will be the year where we implement some changes, as we moderate our spending and growth plans, increase our divestments, and restructure some parts of the company. Going forward, I want Shell to be measured on our competitive performance, and we are taking a time out on complicated targets that are becoming hard to track. We want to generate attractive returns for shareholders and this means returns at a project level, typically on a discounted cash flow basis, and returns on the bottom line, return on capital employed, earnings, cash. That of course also drives Shell’s dividends. Although Royal Dutch Shell’s poor results stood out, the structural problems facing the company aren’t unique. The world’s leading oil and gas producers have spent freely on exploration and production in recent years, despite range-bound prices for Brent crude oil. Deepwater exploration and development is expensive. Although some of the largest oil and gas discoveries in recent years have occurred in challenging deepwater environments, success isn’t guaranteed. Last summer, Total announced a natural-gas find offshore Gabon in West Africa. This deepwater discovery well, drilled to a total depth of 18,323 feet, encountered a productive zone less than 180-feet thick. This marginal find came at a great cost: Total spent almost US$1 billion in Gabon alone in 2013, but the oil giant’s total hydrocarbon production from the nation fell slightly. The Jubilee field located off the coast of Ghana is one of the largest deepwater finds of the past decade. But despite the field’s long-term potential, operator Tullow Oil’s (LSE: TLW, OTC: TUWOY) stock price took a hit when the firm announced disappointing production guidance because of delays in bringing new gas-processing infrastructure online. Tullow Oil’s efforts offshore Ghana have also faced a significant escalation in costs, as the industry rushes to develop the recent batch of deepwater oil and gas discoveries. In late 2013 and early 2014, the major contract drillers began to discuss the potential for a pause in deepwater activity and potential weakness in the day-rates earned by rigs. A total of uncontracted 38 deepwater rigs are slated to join the global fleet this year. Some of these rigs are existing units whose fixtures will expire; others are newly built vessels that will arrive from shipyards. Rig demand would need to grow by 8 percent to 10 percent this year to offset this capacity growth. Unfortunately, the major oil and gas companies’ renewed focus on reining in costs and shifting away from a model that privileged production growth at any cost suggests that demand for deepwater drilling rigs will be flat to slightly lower this year. Older deepwater units will struggle to secure fixtures at favorable rates and may need to settle for less remunerative work in the midwater segment. Contract drillers thus far have shied away from cold-stacking their rigs because reactivating these mothballed units entails significant expense. Depending on the extent to which operators cold-stack older rigs, the emerging overcapacity in the deepwater market could moderate slightly. We’re even more concerned about weakness in the market for jack-up rigs, units that rest on the seafloor and tend to operate in shallow waters. Although the day-rates commanded by jack-ups remain elevated, an influx of newly built rigs over the next two years has increased the risk that day-rates could weaken significantly in 2015. The short-term outlook for floaters [deepwater rigs] is influenced by the low activity level caused by reduced growth and cutback in CapEx [capital expenditures] from the major oil companies. In this regard, 2014 and 2015 show slower growth in activity levels than earlier anticipated. 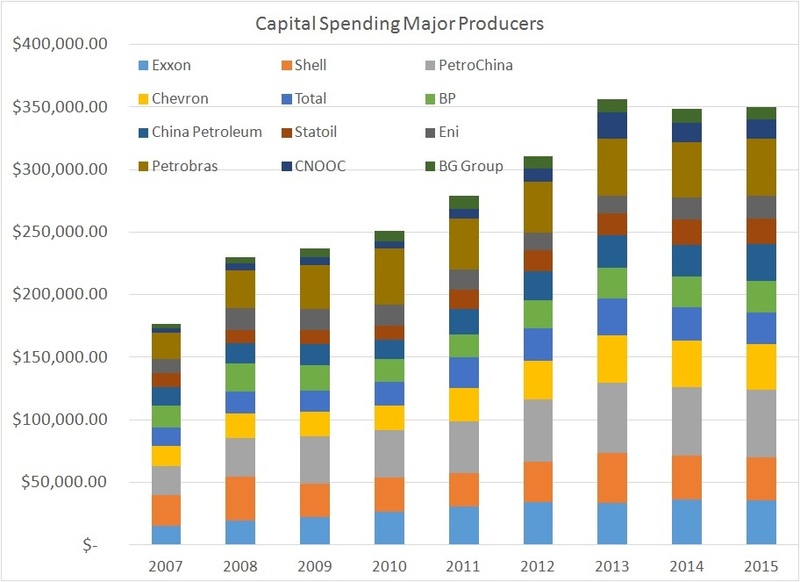 As oil companies’ buckets are reallocated, the entire spending complex tends to slow down. In turn, demand for offshore drilling assets is being pushed back into 2015 and 2016. But importantly, this downturn is not driven by a declining oil price. Prior cycles’ prolonged downturns have been caused by deteriorating hydrocarbon supply and demand fundamentals. On the contrary, the industry is experiencing challenging cost inflation and aging reservoirs while commodity prices are strong and stable. As a result of the pause in offshore spending, we have observed a decline in the overall number of fixtures, lead times and contract durations. We see an increase in inquiries for 2015 and 2016 availability. SeaDrill has managed to limit exposure to 2014 contracting environment to one rig, that’s West Tellus, and is positioned to take advantage of the expected increase in activity in 2015 and 2016. Previous downdrafts in the day-rates earned by deepwater drilling rigs stemmed from weak commodity prices. But this time around, crude oil and natural gas continue to fetch elevated prices in international markets; recent weakness in day-rates reflect a growing cost consciousness among major oil and gas companies, as well as an influx of new rigs that will join the fleet over the next two years. Several factors suggest that the current pause in deepwater drilling activity will prove shorter than previous cycles. For one, reducing capital expenditures won’t address declining output from major onshore and offshore oil fields that have been in production for decades–one of the major reasons why we remain bullish on the price of Brent crude oil in the in the intermediate term. Producers will need higher oil prices to offset cost inflation and justify the capital expenditures associated with additional exploration and development. But these cutbacks have soured the outlook for at least the next 18 months, depending on how the supply-demand balance evolves. Only one of SeaDrill’s deepwater drilling rigs faces a contract rollover, providing near-term insulation against weak day-rates in this market segment. The company’s West Tellus drillship, which earns $635,000 per day under its current fixture, will come off contract in July 2014 and likely will fetch a day-rate in the neighborhood of $550,000. However, SeaDrill will feel the crunch in 2015, when only 72 percent of its drilling capacity will operate under contracts. The company will take delivery of two newly built ultra-deepwater semisubmersibles and two drillships in the first nine months of 2015– none of these rigs has secured a contract. Meanwhile, some of SeaDrill’s existing rigs will complete long-term contracts over the next 18 months. To find additional work, some of these rigs will need to accept lower day-rates and/or shorter assignments. The company’s contract coverage will begin to deteriorate in the second half of 2015, when its newly built units will arrive from the shipyard and the fixtures secured by several of its existing rigs will expire. SeaDrill and other contract drillers have emphasized that oil and gas companies have delayed their capital expenditures into early 2016, as opposed to canceling these projects outright. And the industry has slowed its orders of new rigs to reflect weakening demand. Assuming that these exploration and development projects move ahead as planned, day-rates in the deepwater segment could strengthen. However, if the timelines for these deepwater projects move further to the right, SeaDrill could face a serious cash flow crunch in 2016 and beyond. Management talked down these risks during a conference call to discuss SeaDrill’s fourth-quarter results, noting that producers have inquired about rig availability for late 2015 and early 2015. Regardless of the long-term outlook for deepwater drilling, reduced activity and rig deliveries over the next 12 to 18 months will weaken day-rates and produce a steady stream of negative headlines. Against this backdrop, SeaDrill’s share price could face additional downside. More worrying is the potential for the day-rates to weaken in the shallow-water market. The market for high-specification jack-up units is a distinct bright spot in the market today. Operators have come to appreciate the increased recovery factors that new assets can provide. We’ve seen this trend for some time for our IOCs [integrated oil companies] and more recent shift towards newer units can be seen with our NOC [national oil companies] customers. And I truly believe SeaDrill has demonstrated this with the recent five-rig deal of 30 rig years in Mexico is prime example of the type of activity we are currently seeing. And the rigs coming into the global jack-up fleet had robust profits as we expect. This market will remain busy, 100 percent utilization now and in the foreseeable future. 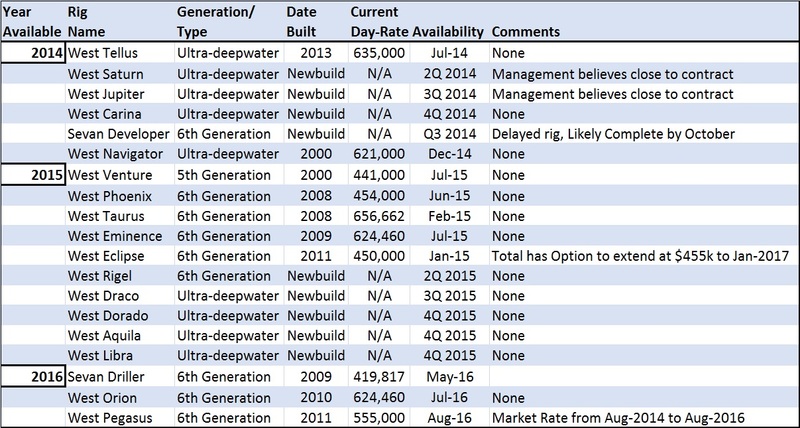 Several other contract drillers echoed SeaDrill’s sanguine assessment of the jack-up market, but others have warned that an influx of newly built rigs in late 2014 and early 2015 could pressure day-rates later this year. Analyst: And just applying to the jack-up market, we also have quite a bit of supply coming out, especially in 2015 with all the big orders this year. Now, your comments on the stability of the jack-up market certainly are encouraging, but is there a prospect for the similar kind of phenomenon happening in the shallow-water market as we get towards the end of this year and into 2015, or is the pace of contracting and tendering stronger, so that you think that those rigs will likely be absorbed without affecting the pricing structure? Roger B. Hunt: Yeah. It’s a great question that all of us are probably asking. If we look at the last couple of years, there has been a similar influx of new supply into the market and that supply has been absorbed. And we’ve had this discussion around rig bifurcation over the past periods. I think the last time we looked, all new deliveries, some 70 fixtures since January 2012 have averaged around $153,000 per day. The pace of influx this year is, I believe, we counted some 23 jack-ups entering the market and as you observe, that number will double next year. So, we look for demand to be relatively stable on the jack-up side. We like what we see in Mexico. We like what we see in the North Sea, both great markets for Noble. The Middle East has been a little more pause, but it’s difficult to get accurate insight into what Aramco is going to do. Southeast Asia, we look for the jack-up count to stay relatively stable. Although Hunt remains cautiously optimistic for the jack-up market’s ability to absorb new supply in 2014, he warns that a wave of newly built vessels and contract expirations in 2015 could pressure day-rates. SeaDrill’s jack-up fleet has significant uncontracted capacity in 2015 and 2016. Although these rigs represent only $4.1 billion of its $20.2 billion contract backlog, deteriorating fundamentals in this market could put the stock under additional pressure. Management has emphasized that the company can fund its current dividend for the next two years with cash flow from its existing contract backlog. However, weakening day-rates would prompt the firm to slow or halt future dividend growth. SeaDrill’s double-digit dividend yield and fleet of newer, high-specification rigs should afford the shares some downside protection. But the stock’s premium valuation already reflects these advantages. Shares of SeaDrill trade at 12 times trailing earnings before interest, taxes, depreciation and amortization (EBITDA) and 8.8 times forward EBITDA; the industry average stands at 8.3 times trailing EBITDA and 6.5 forward EBITDA. 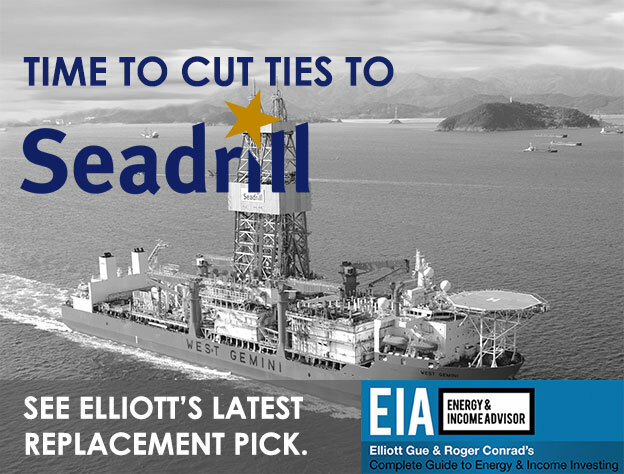 This premium valuation makes SeaDrill vulnerable to headline risks surrounding weakness in the offshore drilling market–a potential headwind with most publicly traded contract drillers announcing results in late April and early May. An End to the Pain? We’ll keep our eyes peeled for several potential catalysts that could improve sentiment toward the offshore drilling market. First and foremost, we’d look for industry participants to announce plans to cold-stack older floating rigs in the back half of 2014; operators won’t make this decision until they’re sure these rigs won’t be able to secure a commercially viable contract. Of the 255 floaters in the global fleet, about half are ultra-deepwater rigs. Older units would be prime candidates for permanent retirement, assuming their owners come to the realization that the cost of upgrading these units would outweigh a potential improvement in contract terms. We will pay close attention to the moves made by Transocean (NYSE: RIG) and Diamond Offshore Drilling (NYSE: DO), both of which have older fleets and will face the most pressure as day-rates deteriorate and their existing contracts expire. We expect the major drillers to abstain from ordering new drilling rigs; SeaDrill indicated that newly built rigs only make sense if prevailing day-rates exceed $525,000. Don’t let SeaDrill’s 11 percent yield lure you in; the stock faces significant downside risk. 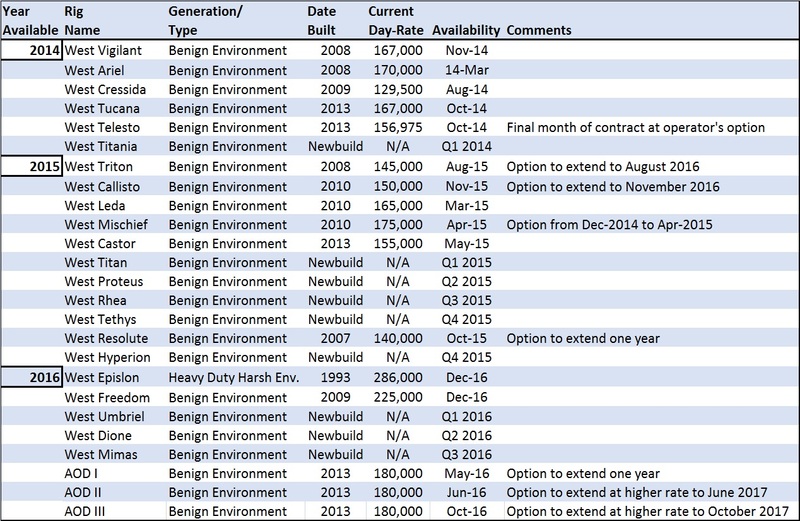 At this stage in the cycle, it’s too early to buy any of the offshore contract drillers listed in our table. However, we recently added one name to our Model Portfolio that stands to benefit in the near term from the pain in the deepwater drilling market.